Ok, I added this flag into the File Attributes dialog (obviously as a read-only field). Regarding ACL - nobody really uses them on Mac, so I see no reason to spend time on this functionality. Thank you! Too bad about ACLs, though. I actually use them, mostly to restrict write access to certain folders, e.g. Desktop. Apple seems to use them a lot to protect default system folders, also in the user's home folder. It's actually an awesome tool to have finetuned control over your system. But if it's too much of a hassle to implement this, I can understand. But maybe a read-only string is possible in the File Attributes window? One additional line per access control entry, e.g. EDIT: or instead of printing the actual ACL, just a part-agnostic info like "ACL yes/no". If you do change your mind at some point in the future, the interface would be straight-forward, something like this. In the meantime, maybe I can cook up some solution for myself. Well, to be honest I'm very surprised you're actually using ACLs! Implementing this feature might eat up to a month, there's no such time at disposal. I also don't think it can be added to the File Attributes dialog, since it supports working with multiple entries and merging ACLs would be a nightmare. I understand. Would be cool, though. And yeah, ACLs are actually pretty great. Apple uses them too for some system locations. I use them a lot on important folders, e.g. in my home directory like ~/Applications, ~/Developer, ~/Developer/Applications, ~/.cache, ~/.local, ~/.local/bin etc. It's a shame so few people use them. * in Mac OS X. 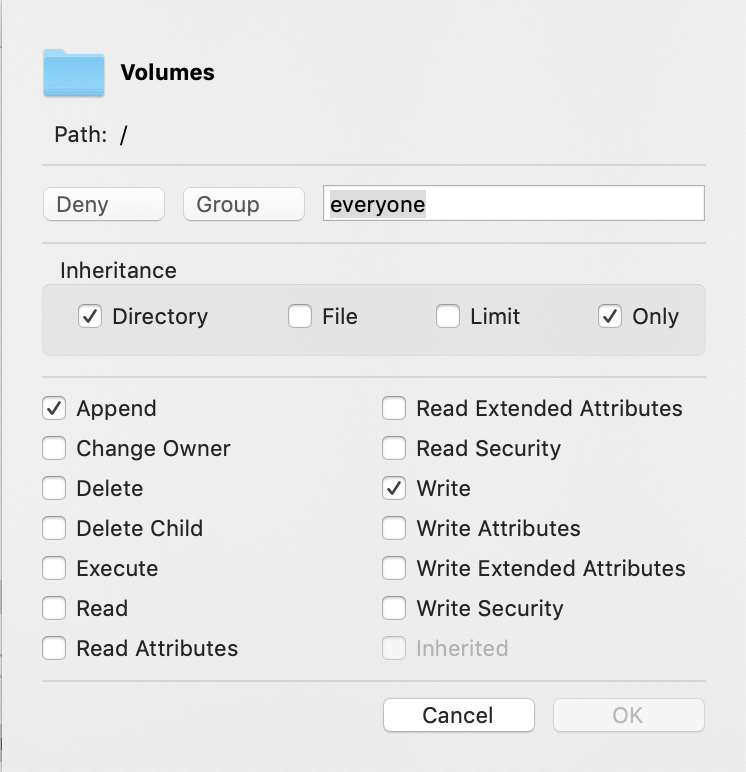 It's a great way to have editable files, and still protect them against accidental deletion, and no root privileges are needed. But not on macOS. If you want that, you need to use the ACL method. Which is a great method, but complex.